Iranian President Hassan Rouhani vowed to “forge ahead” with Iran’s nuclear enrichment program over the weekend and announced the upcoming construction of a second nuclear reactor in the province of Bushehr. Iran’s Bushehr nuclear power plant came online in 2011 and is operated with the assistance of the Russians. Rouhani said that a second reactor would be built in the near future. “Based on our estimates, the second nuclear power plant will be built in the same province and I hope that we can use the facilities of this province,” Rouhani said according to Iran’s state run Fars News Agency. Rouhani’s remarks come as the United States and other Western nations struggle to finalize the details of a recently signed accord that Tehran says will allow it to continue some of its most contested nuclear activities. “Enrichment, which is one part of our nuclear right, will continue, it is continuing today, and it will continue tomorrow and our enrichment will never stop and this is our redline,” Rouhani was quoted as saying on Iran’s state-run television. Rouhani praised the Bushehr nuclear plant, which is not covered under the recently unveiled nuclear deal, in separate remarks over the weekend. “Our first nuclear power plant is active in the [Bushehr] province which will develop, God willing,” Rouhani said during a Saturday evening speech in Bushehr. 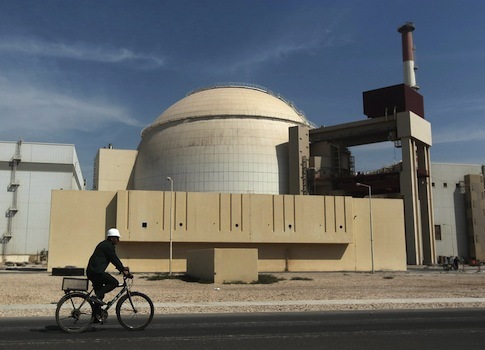 Nuclear experts remained concerned about the Bushehr plant because it is capable of producing plutonium, another nuclear fuel that could provide Tehran an alternate path to a weapon. Iran’s top nuclear official said last month that it would not inform international inspectors about its plans to build new nuclear reactors. “We are not obliged to introduce to the International Atomic Energy Agency [IAEA] the nuclear facilities that we are to build in the future and only 180 days before entry of nuclear substances there, we will inform the IAEA of them,” Iran’s top nuclear official was quoted as saying. Iran has designated dozens of new nuclear sites in addition to the second facility at Bushehr in recent months. Top Iranian officials have lashed out at the United States and other Western nations in recent days, accusing them of misleading the public about the details of the draft nuclear pact inked late last month in Geneva. The White House and State Department said last week that the deal announced in Geneva was actually a framework pact that must still be finalized. This means that Iran has the ability to fully continue its nuclear activities as final details are hashed out. Iran’s anger over what it claims are misleading reports about the deal have been coupled with an increase in major military announcements. Iran’s Islamic Revolutionary Guard Corps (IRGC) Brigadier General Hossein Salami said last week that Tehran had mastered ballistic missile technology. Meanwhile, a Kuwaiti newspaper reported over the weekend that President Barack Obama signaled that he is willing to travel to Iran for a face-to-face meeting with Rouhani. President Obama is reportedly waiting on an invitation from Rouhani, according to Kuwait’s Arab language Al-Jarida newspaper. President Obama is said to be “willing” to be the first president in recent history to visit Iran, according to the report, which was widely disseminated in the Iranian press, including the Islamic Republic News Agency (IRNA). The State Department did not respond to multiple Free Beacon requests for comment on the report.